The UC/team collaboration world wouldn’t be anywhere without headsets and phones on which to conduct those voice and video conversations. Here’s a look at some of the latest news in this product category. Audio solutions provider Sennheiser launched its double-sided MB 360 UC headset, aimed at workers who need to concentrate in noisy environments like open offices or coworking spaces. It features active noise cancelling (ANC) technology, and soft earpads for wearing comfort throughout the workday, Sennheiser said. Sennheiser has optimized the MB 360 UC, which supports up to 25 hours of talk time, for use with UC applications. However, the headset also connects to a mobile device for on-the-go use. Separately, Sennheiser announced availability of USB headsets compatible with AWS’s contact center and team collaboration solutions, Connect and Chime. As such, Sennheiser is now part of the AWS Partner Network, the company said. Jabra launched its second-generation wireless earbuds, Evolve 65e, featuring a soft neckband. The Evolve 65e is UC-certified, including for Microsoft Skype for Business, and features a battery life that can support eight hours of talk and 13 hours of music. The Evolve 65e earbuds come with a Jabra Link 370 USB Bluetooth adapter for simultaneous connectivity to a laptop or PC and smartphone. Wireless range is 100 feet for PCs and 33 feet for mobile devices, for roaming during calls. It also features a built-in busy light that acts as a “do not disturb” signal to co-workers when on a call. 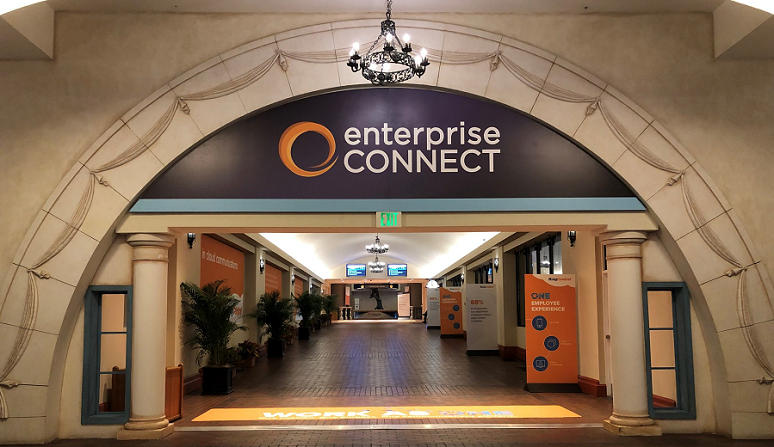 “Enterprises are constantly seeking new ways to enable their employees to be productive wherever they are, making UC one of the most important mobile technologies today,” said Holger Reisinger, SVP of enterprise solutions at Jabra, in a prepared statement. Yealink, longtime Microsoft UC device partner, announced enhanced interoperability with Microsoft Teams through three new phones: the entry- and mid-level desk phone T56A, the premium desk phone T58A, and conference phone CP960 for huddle rooms and large conference rooms. All three devices come embedded with a native Teams application that incorporates calling and meeting features. Further, these Yealink devices are designed to support future builds so that AI enhancements can be made to make communication smarter, Yealink said. Panasonic System Solutions Company of North America announced the launch of the Panasonic KX-TPA68, a SIP cordless communication terminal. The new cordless desk phone offers a “real-time shared call appearance” that lets users pick up, retrieve, and join calls from lines shared across multiple desk phone units connected to the same base unit, Panasonic said. Users can monitor the status of up to six lines from the same touchscreen display. The KX-TPA68 comes with a 3.5-inch color LCD, a full-duplex speaker phone, and higher voice volume than the previous model. It also features an upgraded noise reduction feature for automatically adjusting audio volume in noisy environments. It works alongside any combination of up to seven additional Panasonic cordless or desktop DECT phones per KX-TGP600 base unit. Another hotbed of activity at EC19 was the video collaboration and AV space. BlueJeans Network revealed plans to offer a new service-based subscription model for organizations looking to adopt its cloud meetings platform with audio hardware from its partner, Dolby. This rooms-as-a-service packaging provides the BlueJeans Rooms license, Dolby Voice Room hardware, and maintenance and support in a single invoice. Coupling devices with cloud services in “as-a-service” packages is a rising trend, as we’ve seen from companies such as Avaya, which introduced a huddle-as-service offering in early March. The goal of such offerings is to deliver predictable pricing along with an easier approvals process and the ability to add rooms as needed without pain, said John Knightly, SVP product and solution marketing, in a No Jitter briefing on the EC Expo floor. 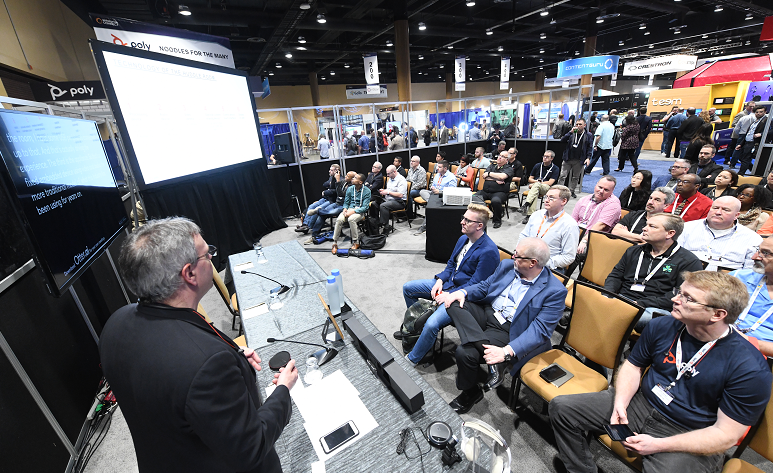 This rooms-as-a-service concept is catching on with IT, said Ira Weinstein, managing partner at Recon Research, as well as the EC19 Video Collaboration & AV track chair. In interviews with 24 end-user technology managers, Recon learned all were either somewhat or very interested in such a model. “Even massive companies with huge deployments were intrigued by the idea of a turnkey offering of this kind,” said Weinstein, in a prepared statement. Cloud-based video conferencing provider Lifesize has expanded its line of 4K-capable meeting room systems with two models -- the Icon 300 and the Icon 500 -- for huddle rooms and midsized meeting spaces. Given the “critical role in organic collaboration” these smaller meeting spaces play within an organization, the company’s goal with these new models is to do away with the technology disparity between them and larger meeting spaces, said Lifesize CEO Craig Malloy, in a prepared statement. Toward that end, while the Icon 300 is designed to serve huddle rooms and other small spaces, it also provides advanced capabilities such an ultrawide field of view, support for 4K full-motion content sharing, and noise-reducing audio. The Icon 500, for medium-sized rooms, also provides full-motion 4K content sharing, as well as 4K video quality. In addition, the 500 model supports dual displays and integrated 5x zoom for high-fidelity views of speakers and content, Lifesize said. Both models are purpose-built for use with Lifesize’s cloud-based video conferencing service. The Icon 300 is available now, beginning at $3,000. The Icon 500 is available for pre-order, with general availability expected this summer. Pricing should fall between the Icon 300 and the Icon 700, which is tagged at about $7,500, the company said. Bluescape announced a digital whiteboard feature to bring “back the fun and imagination around brainstorming,” the company said. This digital whiteboard is available for individual or team use on touchscreens running on Linux. Users can import their whiteboards into a Bluescape workspace for additional collaboration. Separately, on the administration front, Bluescape announced functionality that allows clients to customize security to fit their network protocols, rules, and access controls. Via a new “custom roles” feature, organizations can set different user and access permissions at three levels: applications, organization, and Bluescape workspace. Additionally, as part of its efforts to expand the collaboration experience for its users, Bluescape announced API enhancements for Adobe Creative Cloud. Via a plugin for Adobe Photoshop users, Bluescape enables people to work, update, and share photos and graphics in Photoshop, Bluescape, and other design applications without having to leave the application. For Adobe users, Bluescape is offering a free one-month trial program of Bluescape, available for download on the Adobe Exchange Marketplace. Kaptivo, our Best of Enterprise Connect 2019 finalist for the Best Communications/Collaboration Device Category award, announced Kaptivo Business Edition, a lower price point version of its whiteboard collaboration system aimed at organizations with smaller deployments. Kaptivo uses patented digital image processing technology to capture, render, and stream a version of a standard whiteboard viewable via the Kaptivo Web-based app, on any device, or shared live through video conferencing systems like BlueJeans, Cisco, Lifesize, Polycom, Zoom, and others, the company said. 3,000 customers choose winners in Eastern Management Group PBX customer satisfaction study. Xorcom, RingCentral, and Vertical Communications rate highest in overall satisfaction in global survey.